By Alan Green in VectorVest on 9th August 2017 . Singapore-based Avation PLC, (AVAP.L) is a specialist commercial passenger aircraft leasing company managing a fleet of aircraft which it leases to airlines across the world. AVAP customers include Flybe, Virgin Australia, Thomas Cook, Condor, Air France, Air Berlin, Air India, Vietjet Air, Fiji Airways and Mandarin Airlines. Avation also has a subsidiary that supplies aircraft parts and spares to a range of operators, internationally. Following our article of Nov 23rd 2016, AVAP has once again flagged across key VectorVest metrics following the trading update outlined above. The Relative Timing (RT) trigger, which flagged AVAP in the Nov 2016 article once again rates the stock at 1.45, which is excellent on a scale of 0.00 to 2.00. Since our last article, shares have since hit and passed our then target of 226p, but despite this, the VST-Vector (VST) master indicator for ranking every stock in the VectorVest database logs a VST rating of 1.22 for AVAP, which is still good on a scale of 0.00 to 2.00. The VST is computed from the square root of a weighted sum of the squares of Relative Value (RV), Relative Safety (RS), and Relative Timing (RT). 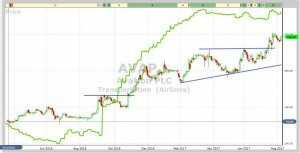 The chart of AVAP is shown below with the original call last November marked. The share has recently broken out of an ascending triangle pattern and is on a BUY recommendation on VectorVest. Of note is the last reaction low charted on the 3rdAugust 2017. This low is higher than the last major high (as defined by the highs of the ascending triangle. This expansion indicates that a strong trend is in process. Classical charting techniques indicate a target for AVAP.L in excess of 300. 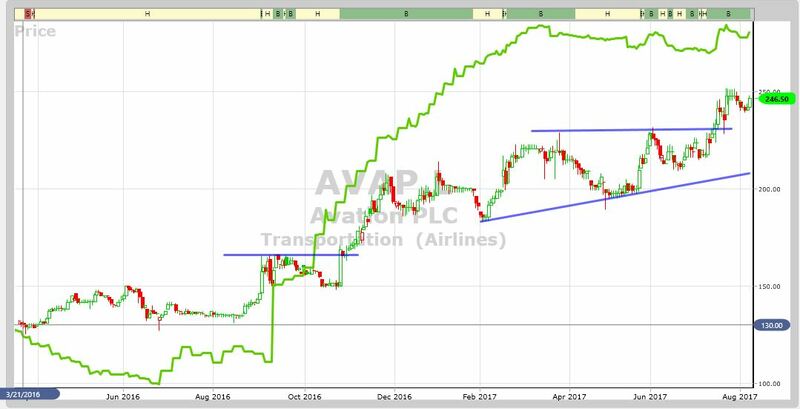 Summary: Trading now at 246p, AVAP shares have both hit and passed our Nov 2016 target of 226p. Supported by the exceptionally strong charting configuration, steady growth in revenues and stated pursuit of growth, VectorVest continues to view AVAP as a solid investment opportunity. As such we reiterate our buy rating, and raise the target price to the current VectorVest valuation of 280p. Readers can examine trading opportunities on AVAP and a host of other similar stocks for a single payment of £5.95. This gives access to the VectorVest Risk Free 5-week trial, where members enjoy unlimited access to VectorVest UK & U.S., plus VectorVest University for on-demand strategies and training. Link here to view.